Thread: How would we multibox Vanilla if follow is removed? No brew-pups, 3 seater mounts or anything of that nature. Im just trying to think of the worst right now and prepare. I know alot of it is speculation, but knowing Blizzard they might remove follow in Vanilla. but knowing Blizzard they might remove follow in Vanilla. You'll have to specify as to why you think that might happen. The removal of /follow in battlegrounds 2 expansions ago while still retaining follow in other environments doesn't really suggest that they would have any plans to remove follow completely. To stay on topic: you'd be reliant on broadcasting movement keys, click to move and doing individual movement. Probably not what you're looking for, but that would be the scenario you're suggesting. We're not always meant to find a perfect substitute of doing exactly what we want if the developers intentionally (which is what you are suggesting) restrict said functionality. I haven't played the last couple of expansions but from what I've read I was under the impression that follow being disabled in the open world is tied somehow to the new PvP talent system toggle, warfronts and all that goofy new stuff? Yeah, while I was quick to post last night since it was right before bed, it's precisely what Wubsie has said. Just one minor correction, though... /follow has been out of battlegrounds since patch 5.2, which was released in March of 2013. While "two expansions ago" doesn't sound like a long time, it has been over six years at this point. I was under the impression that follow being disabled in the open world is tied somehow to the new PvP talent system toggle, warfronts and all that goofy new stuff? Follow ceases to function when you engage in any PvP combat, regardless of what you're doing or where you are. That's all there is to it, with the one exception that is mentioned above: follow is simply disabled on all battleground maps. The recent change in BFA has limited multiboxers to the point where world PvP can still be done, but it's unlikely that you can be an unstoppable killing machine capable of disrupting everyone around you for an extended period of time, and it's more likely that you're going to have some downtime as you find yourself running back to your corpse more often. I haven't actually played the last couple of expansions but didn't they introduce a system that toggles different talent based on whether you're in PvP or PvE combat? I had assumed that /follow being disabled while in PvP combat is connected to that system. Considering that system doesn't exist in vanilla there's a chance follow may work independently. As far as I recall in Legion your PVP talents were only active while you were tagged for PVP combat or in designated zones, world quest areas or instances. This is not really the case anymore. Now you have your talents available at all times in Warmode , or while in PVP instances. I assume dueling in both systems toggles the talents as well, although I never tried in either. As far as we know the same API strings having to do with the follow disabling while in PVP combat were found in the Classic test client, so currently there is no reason to believe that the same system would not exists in classic. I.E. It appears Classic will not have follow while in PVP combat. 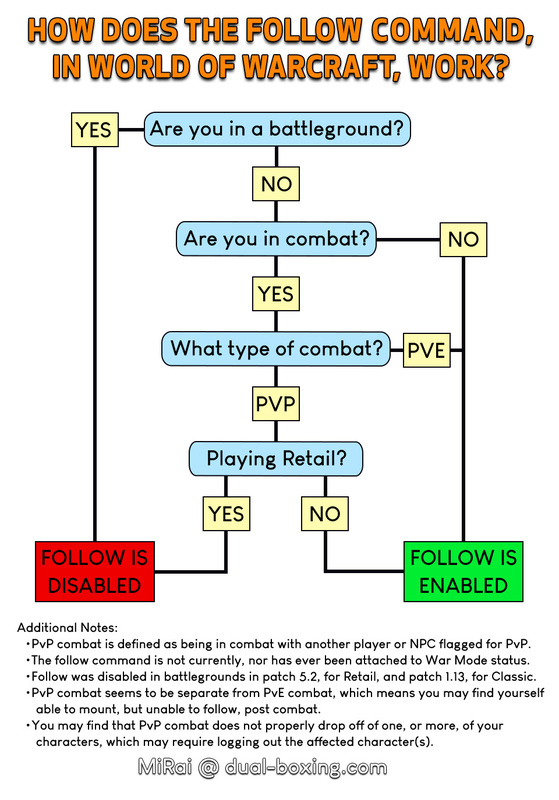 If you're referring to the War Mode toggle introduced in the latest expansion, then, no, it is not connected to PvP combat, other than you can find much more PvP-related combat with War Mode enabled, but there's nothing stopping someone, who doesn't have War Mode enabled, to pick a fight with any NPC that is flagged for PvP, which, in turn, toggles PvP combat. While who knows really which way Classic is going to fall on /follow in pvp, I am leaning towards it being disabled like it is currently. Acti-Blizzard are reducing their CS spend as much as possible, and pvp multi-boxers are a source of aggravation and thus tickets from the average slack-jawed WoW player. I'm thinking that Follow will be disabled in BG's but not in Open world when you enable PvP. Just like in Vanilla people were able to gank each other.